One reason for investor faith in this public sector behemoth is clearly the coming to power of the new Narendra Modi-led National Democratic Alliance government. ONGC CMD V.K. Sarraf at a public park in Delhi. On January 16 this year, Sudhir Vasudeva, then Chairman and Managing Director of Oil and Natural Gas Corporation (ONGC), and Dinesh Kumar Sarraf, then head of its foreign assets' arm, ONGC Videsh Ltd (OVL), both sat glued to their TV sets. They wanted to know the outcome of a meeting an Empowered Group of Ministers (EGoM) was holding that day to decide on the disinvestment of 10 per cent stake in Indian Oil Corporation (IOC). The United Progressive Alliance government was still in power and anxious to reduce the fiscal deficit before the general elections in April/May. Private investors had shown little interest in buying IOC shares when their sale was first mooted, primarily because the company's revenue was hurt due to the government's uncertain subsidy payment mechanism. But Vasudeva and Sarraf knew that not only was the EGoM likely to endorse the sale anyway, but that the government would also insist ONGC and Oil India Ltd buy five per cent each of IOC. Vasudeva had tried hard to convince the then petroleum minister Veerappa Moily that it would be a poor investment decision for ONGC, but to no avail. Soon TV flashes confirmed his worst fears. But Sarraf, who took over as CMD in March following Vasudeva's retirement, says he reacted differently. "I picked up my tablet and did some calculations," he told Business Today. "I took into consideration that the under-recovery on diesel was about to be neutralised. I noted that petrol was already decontrolled. I called Vasudeva and told him we should ask for a bigger stake in IOC." Sarraf's response reflected not only his innate optimism, but also his thorough understanding of the company and the industry's financials. (He was Finance Director at ONGC before taking over OVL.) And he has been proved right. Despite the IOC stake purchase, ONGC's average market value was Rs 3,39,456 crore (April to September 2014), an increase of 31.2 per cent over its average market value of Rs 2,58,668 crore the previous year (April to September 2013). ONGC also ranks second by market value in the BT 500 list this year, behind only Tata Consultancy Services (ahead of even Reliance Industries). One reason for investor faith in this public sector behemoth is clearly the coming to power of the new Narendra Modi-led National Democratic Alliance government. Though ONGC is supposed to be autonomous, government intervention in its functioning is an open secret. But Modi enjoys a pro-reforms, market-friendly image, and has roused expectations that he will grow ONGC the way he did the Gujarat government-owned oil and gas company, GSPC, during his tenure as Gujarat chief minister. "There is optimism in the market, largely because of the new establishment at the Centre and ONGC cannot stay unaffected," says Sarraf. Already changes are afoot. Three independent directors have been removed from the ONGC board - P. Uma Shankar, former power secretary; R.K. Singh, former Bharat Petroleum Corporation Ltd (BPCL) chairman; and S. Ravi, a chartered accountant. In June, ONGC also sold its entire 46 per cent equity in ONGC Mangalore Petrochemicals Ltd (OMPL) to its subsidiary, Mangalore Refinery and Petrochemicals Ltd (MRPL), since OMPL and MRPL have greater synergies. "ONGC's performance is being monitored very closely now," says Narendra Taneja, convenor of the Bharatiya Janata Party's energy cell. "It has to make a presentation every week to the petroleum ministry, which was not the case earlier." But the big, unresolved question is gas pricing. In the last months before it was voted out, the UPA government had evolved a new gas pricing formula that would have raised domestic gas prices to $8.3 to $8.6 per million metric British thermal units (mmBtu) from the current range of $2.3 to $6 mmBtu, bringing them closer to prevailing global prices. The matter being politically sensitive, the new government deferred a decision on its implementation on coming to power. The final decision is likely to be taken at a cabinet meet on November 15. Huge gains in both revenue and profit are likely to accrue to ONGC if indeed the new formula comes into effect. Besides, as Sarraf predicted while supporting the purchase of IOC shares, diesel under-recovery is now a thing of the past. With the new government continuing the UPA government's policy of raising the diesel price by 50 paise per litre every month, diesel now earns a profit of two rupees per litre. In 2013/14, ONGC gave discounts worth Rs 2,72,721 crore to the oil marketing companies to partially meet the oil subsidy - this may now fall steeply. "If the company's contribution is reduced, we will have better net realisation of our crude oil. We will obviously have more cash in hand, and can invest more," says Sarraf. Again, global crude prices have fallen below $100 a barrel for some months now and market predictions maintain they are likely to stay this way, but this in no way hurts ONGC. "If the subsidy burden reduces, it will increase the net realisation per barrel," says R.S. Sharma, former ONGC CMD. OVL's overseas acquisitions are also brimming with potential. It made four acquisitions in 2013/14 for a total cost of $11 billion of which the largest was a 20 per cent stake in the Rovuma Basin (Area 1) off the coast of Mozambique. Area 1 is estimated to have recoverable gas reserves of 45 to 70 trillion cubic feet - in comparison, Reliance Industries' (RIL) D6 block in the Krishna Godavari (KG) Basin, at its peak, had a potential of around 11.3 trillion cubic feet. The deal was sealed in January, but certain clearances are still awaited before production can start. Most of the gas can be brought to India. "It will happen at international prices, but our presence there will ensure supplies," says Sarraf. To facilitate this, ONGC plans to set up a liquefied natural gas (LNG) import terminal at Mangalore, along with BPCL - which also has a 10 per cent stake in Rovuma Area 1. Plans are also afoot to buy a stake in an LNG export terminal in the US. With these, India's LNG import capacity will rise from the current 15 MTPA (metric tonne per annum) to 45 MTPA. In coming years, India is expected to become the world's second biggest natural gas importer - after Japan. With a daily output of around 60 million cubic cm, ONGC is already the country's biggest gas producer. Further domestic supplies are expected from an oil and gas reserve in the KG Basin, next to RIL's D6, which is estimated to have around one trillion cubic feet of gas. It is likely to become operational from mid-2018. 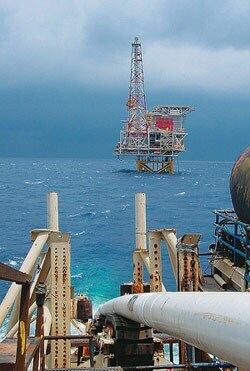 A year later, the Daman offshore gas field on the western coast will also start production. Sarraf expects the Daman offshore field to contribute 20 per cent to the country's total gas production once it reaches its peak. ONGC is also exploring shale gas possibilities in the Cambay and Raniganj basins - a segment into which private players have so far not been allowed. ONGC's subsidiary MRPL has 2,000 licences to set up petrol and diesel retail outlets and plans to start utilising them soon. "Petrol is decontrolled and there is no under-recovery in diesel any more. It is a good time to get into retail," says one of ONGC's directors. "But the perfect time will be once diesel is decontrolled as well." It could, however, face competition from private players like RIL, Shell and Essar Oil, who too have 2,000 licences each. "There are advantages and disadvantages to being a PSU," says ex-CMD Sharma. "On the one hand you share the burden of the downstream companies' under-recoveries. But on the other, you get a head start over private players in a pioneering field like shale gas exploration. You also get government support for your global acquisitions." Right now, it is the advantages which appear prominent. "ONGC is on a dream run," says Jayant Manglik, President of brokerage firm Religare Securities. "Everything it touches is turning to gold." Not surprisingly, the government plans to make the most of it by divesting another five per cent in the company, reducing its stake to 62 per cent.